Hostess and Steward Black There are 7 products. 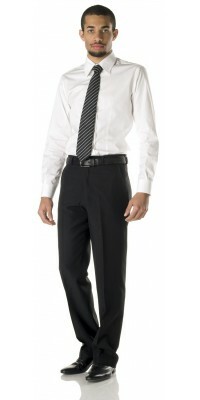 Corbara Professional Wear: quality and convenience with our Hostess and Steward uniforms in black wrinkle free polyester. This line of professional wear is produced in 100% polyester victory gabardine. This material guarantees excellent durability in time, is completely wrinkle free and looks “like new” even after many washings; it should be noted however that, apart from the typical qualities of polyester, it is a synthetic fabric and has one limitation: it is not very breathable and therefore not very suitable for the summer. Therefore, the hostess uniforms in this series are ideal for hotel workers who prefer very resistant representative apparel, but without any special need for comfort. This line of attire is composed of a Spoleto man’s jacket, with three-button, a very feminine model, slightly short, called Igea, and still for women, the Faenza jacket with the particular white insert on the neck. They can be combined with a man’s flat front trouser, model Callisto, woman’s Nila trouser, classic skirt Ametista, and longuette skirt Opale. All of these garments are in black. See also Hostess and Steward uniforms in Blue Marine. Women's jacket with one button, model FaenzaBlack colour - LinedWhite profile on the collar and on the cuffsImmediately available for delivery: sizes from 42 to 48Made of Victory Gabardine, 100% Pol. Black longuette skirt, model Opale length cm. 64 (hem to be made)lined, with rear slash Immediately available for delivery: sizes from 42 to 48Made of Victory Gabardine, 100% Pol. Men's classic jacket with 3 buttons, model Spoleto Made of light-weight Gabardine - Lined Black colour Immediately available for delivery: sizes from 46 to 56 Made of Victory Gabardine, 100% Pol. Hostess' jacket with three buttons, model Igea Made of light-weight Gabardine - Lined Black colour Immediately available for delivery: sizes from 42 to 48 Made of Victory Gabardine, 100% Pol. Men's flat front trousers, model Callistoamerican style pockets and lining up to the knee Made of light-weight Gabardine - Black colourImmediately available for delivery: sizes from 44 to 56Made of Victory Gabardine, 100% Pol. Women's trousers, model Nila zipper on the front and two side pockets Black colour - belt with loops and buttons of the same colour Immediately available for delivery: sizes from 42 to 48Made of Victory Gabardine, 100% Pol. Pencil skirt, model Ametistalength cm. 56 (hem to be made)Made of light-weight Gabardine - Black colourImmediately available for delivery: sizes from 42 to 48Made of Victory Gabardine, 100% Pol.